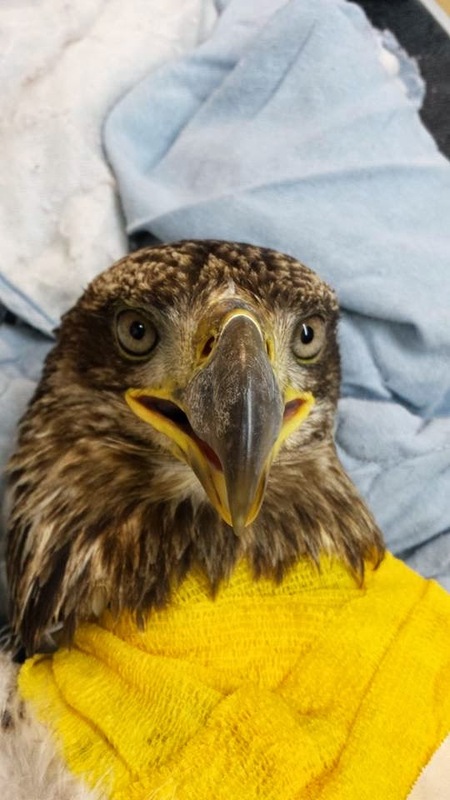 Appalled by the shooting of a young bald eagle in Otsego County this past weekend, the Middleburgh based New York State Wildlife Rescue Center is offering a $1,000 reward for the arrest and conviction of the person or persons responsible for the crime. Shot near New Lisbon, a rural small town north of Oneonta, the eagle was brought Saturday evening to Wes Laraway, managing director of the wildlife center, whereupon he took immediate action to keep the bird alive. Actions which included giving the bird pain medication and wet packing the bullet wound. Transported to the Cornell Wildlife Clinic for treatment and surgery the following morning, the bald eagle was saved, but it will unfortunately be grounded for the rest of its life, which may last for as long as forty more years. Personally disgusted by the act, Laraway at-first offered a $200 reward for information on his personal facebook page starting Monday night, but drawing a wide range of support from friends and supporters alike, the bounty quickly rose to a thousand dollars in just a few days and it is still growing. Commenting that he started the reward because shooting the eagle "was a horrible thing to do," Laraway hopes the culprit will be brought to justice and that it will "deter someone from doing it in the future." Nearly going extinct due to contact with dangerous pesticides and a lack of nesting sites only forty-two years ago, the bald eagle was removed from the federal list of endangered species in 2007 after its population rebounded. However, the national symbol of the United States remains protected by three separate laws. Laws that could lead individuals accused of capturing, killing, shooting, or wounding a bald eagle to face up to $250,000 in fines or two years in prison if convicted on the federal level. Civil penalties may also include the possibility of fines or jail time. Although happy that the bird is alive, Laraway is sorry that it will have to spend the rest of its life out of the air, but he accepts that it is better than the alterative. Saying that the crime was unacceptable, the wildlife rescuer was baffled that someone would use the national symbol for target practice. If you or anyone you know has any information regarding the shooting of the bald eagle, you may contact the New York State Department of Environmental Protection hotline at 1800-847-7332. Reward posters are available by contacting Mr. Laraway at laraway@midtel.net for a pdf copy.